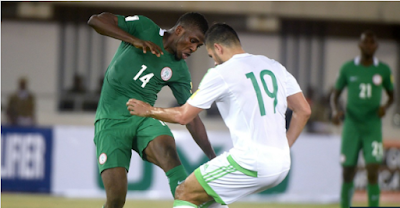 Algeria held Nigeria to a 1-1 draw in their final Russia 2018 World Cup Qualifying series at the Stade Mohamed-Hamlaoui on Friday evening, November 10. A late spot kick from captain Yaccine Brahimi cancelled out John Ogu’s stunning 63rd minute opener to deprive Gernot Rohr’s side – already qualified for the quadrennial showpiece – their second away victory of a successful campaign. With the match of less importance to the Super Eagles – and injuries to key members of the squad, Gernot Rohr rang the changes, most notably with a fresh forward line as Hapoel Beer Sheva’s Anthony Nwakaeme, flanked by Kelechi Iheanacho and Alex Iwobi, was handed his international debut. Wilfried Ndidi was retained in midfield alongside Oghenekaro Etebo and John Ogu. Leon Balogun skippered the side as Mikel Obi watched from the sidelines.